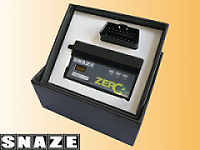 The SNAZE Zero EcoPower is plug n play easy installation product.It will automatically sense and adopt different protocol on board. No any technical background required. In most case, the Auto-negotiation mode will work properly, for some rare model cars, manuel mode is also provided. You can adjust dip with to match various ECU type. If you have trouble to locate dip switch, you are welcome to ( Support Service > Wiring Diagrams ). 1. Intelligent Fuzzy logic power and fuel saving mode. 2. Fire resistant ABS material case, UL standard. 3. Support USB firmware upgrade. 4. Auto/manual swith PWM,VPW,ISO,KWP and CAN communication protocol on OBD II. ■ Copyright ©2005 Snaze Technology Co., Ltd. All Rights Reserved.